Solar radiation is radiant energy emitted by the sun as a result of its nuclear fusion reactions. For the purpose of Solar Water Heaters, we are only interested in the solar radiation that falls on the earth’s surface. 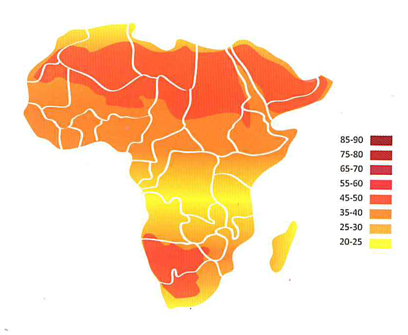 South Africa has one of the highest levels of solar radiation in the world. The solar radiation of South Africa ranges from around 1450 kWh per square meter to about 1950 kWh per square meter per year, compared to Europe which on average is 1000kWh per square meter per year. View Solar UV range for the world and South Africa! Learn how to setup your solar geyser to benefit the most from the movement of the sun in South Africa!